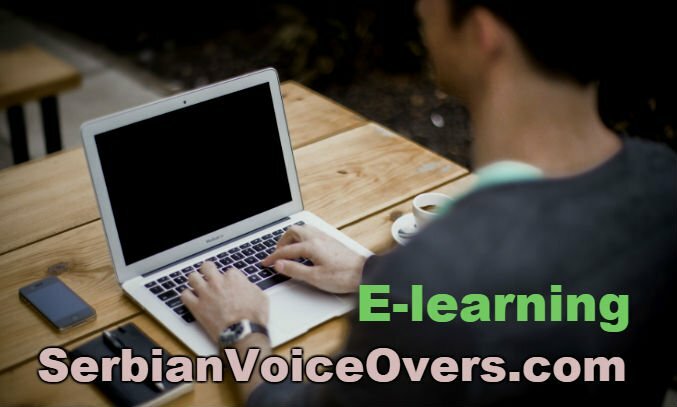 Serbian e-learning voice over narration can be used for many applications such as explainer video, training courses, gemification game-based learning voice over, step by step instructions, technical information, safety videos, online tutorials and many other informational and educational programmes. Some of our professional serbian voiceover artists can provide you with a clear and accurate narration. In the past two decades in the world, e-learning has never seriously threatened to replace the concept of attending classes in a traditional way, from the desk. Learning through the Internet was just inevitable addition to lessons in the classroom of which were expected to do the work of teaching. Last years, young people in Serbia, better and better understand how the technology let us into a virtual chamber of knowledge, to which we can access from a warm corner of our room. Many students in Serbia, experience e-learning as something that saves time, whether it is a university education, courses within the company or individual. They are aware that through e-learning they can have a class anywhere and anytime and it can last as long as they need. In addition, E learning is seen as a system that much easier and faster can meet the individual requirements of students. Serbian voice talents are able to assist you, by following precise instructions that you should deliver. Important informations are the length of the video and the number of words in the script delivered in the Serbian language. Contact us, send your script for a price quotation or number of words in your script . We need to check the availability of the serbian voice actors. Remember, we are cheaper because we are the actual source here in Serbia!